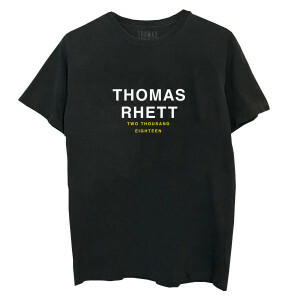 Black T-Shirt with Thomas Rhett logo on the front and photo and tour dates on the back. One of my favorite shirts now! Absolutely love it! Great material! Doesn’t fade in the washing machine! It was a very comfortable shirt, and looked exactly as advertised online. It is soft and runs just a bit bigger than the size - which is perfect because that’s what I wanted for this shirt. Super comfortable. The only “disappointment” I had with the shirt was the omission of Lexington, KY. 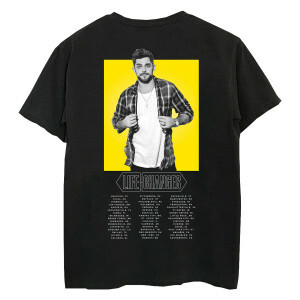 I bought the shirt to commemorate the concert I went to, but it wasn’t listed on there. Still love &amp; wear the shirt! The T shirt is vey well made and true to size. Unfortunately it doesn’t have Providence on the list even though Thomas had a terrific performance there on September 22. I am still wearing it. Love it! So comfy &amp; fits as expected!! Fit as expected. My daughter loved wearing it &amp; said it was comfortable!! 10/10!!! Amazing shirt. Super soft and perfect for any occasion. Would totally recommend ???? The shirt is amazing! Perfect fabric.